The uniquely diverse topography and climate of India provides a natural habitat for an equally varied amount of wildlife, flora and fauna.India is spread from high slopes of the Himalayas to the Thar Desert of Rajasthan, the swamps of the Sunderbans in Bengal and the forests of the Western Ghats, this vast country supports a kaleidoscope of biodiversity thus providing great opportunity. 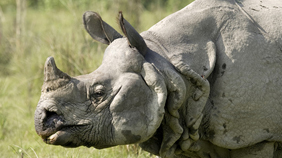 There are around 57 critically endangered animal species found in India. 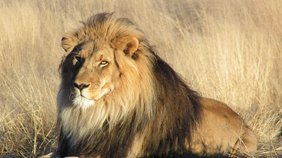 The list includes Asiatic bear, primarily found in Himalayan regions, Asiatic lion, now surviving only in Gir National Park, Gujarat, leopard (common, snow and clouded species), wild buffalo - found in Assam and Royal bengal Tiger. 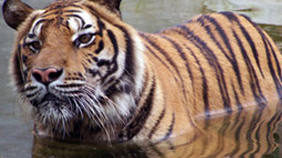 Go on a Tiger Safari and take an unforgettable journey deep into India's exotic lush wildlife sanctuaries. India is a land that is truly wild at heart and its rich and thick jungles (forests) and the unique and fantastic array of wildlife has inspired numerous tales and fables, the writings of Rudyard Kipling - the most famous The Jungle Book. 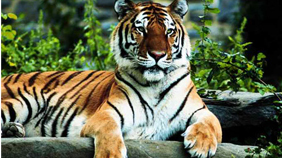 The most important attraction to Indian wildlife is the majestic and unfortunately increasingly endangered Royal Bengal Tiger, but it is home to many other rare and spectacular animal species - Asiatic Lion, Leopard, Sloth Bear and Indian Rhinoceros, Asian Elephant, Black Buck, Water Buffalo, Nilgai, Gaur, Himalayan Wolf, Striped Hyena, Golden Langur, the list just goes on... The only place in the world where both the tiger and lion can be found in the natural habitat is India. 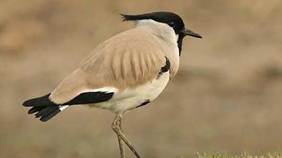 Being on the main migratory routes, India has over 1200 species of birds and is a great destination for bird-watchers. Here are some inspirations for experiencing the spectacular wildlife of India. These are suggested tours and can be 100% customised. Let us know your travel plans and we would be happy to create a memorable tailor-made tour for you. Admire the beauty of "the jewel of Muslim art in India", Taj Mahal and go on the trail of the majestic Bengal Tiger at Ranthambore National Park. 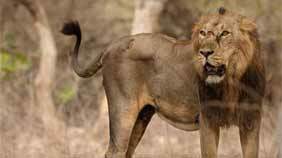 Gir National Park is the only place where one can see the Asiatic lions apart from the African continent in its natural habitat. Sasangir falls in the state of Gujarat. Elephant safari in western, central and eastern ranges of the Kaziranga National Park, search for the rare Hollock Gibbon and Hornbills, visit a Tribal village or tea garden. 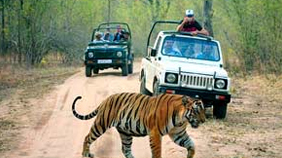 Experience the enchanting Rajasthan, excursion to samm sand dunes, go on a tiger safari at Ranthambore National Park. Go on jungle excursion by jeep/elephants to spot the Royal Bengal Tiger, admire the mesmerizing backwaters and houseboats. On the safari you will have the chance to see the biggest animals found in India jungles - Tiger, Guar, one horned Rhino & elephants. The tour is best for both the nature lovers as well as photographers as it provides ample opportunities to for photography and nature walks.